2019 politics is about to begin. 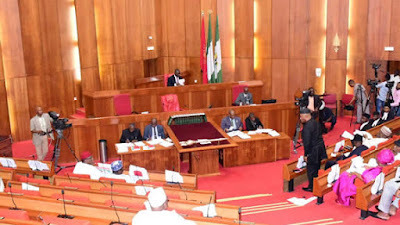 About 10 members of the Senate have staged a walk-out in protest against the adoption of the report by the Senate and House of Representatives Joint Committee on the Amendment to the Electoral Act. The protesters say despite the adoption of the report by the Senate, they would insist on its reversal. They alleged that the amendment was targeted at President Muhammadu Buhari. Chairman of the Senate Committee on the Independent National Electoral Commission, Senator Suleiman Nazif, had presented the report at the plenary on Wednesday. After the presentation, President of the Senate put the adoption of the report to voice vote, saying there was no need for debate on it as it was from a conference committee which had harmonised the versions of the two chambers. After the vote, the ‘ayes’ had it and Saraki ruled on it — a development that generated an uproar in the chamber. Saraki also ruled against three senators who raised points of order to protest against the adoption.